(Nanowerk News) University of Maryland (UMD) researchers make breakthrough discovery in graphene research that could provide a testbed for understanding how electrons move in extremely high magnetic fields. Since its discovery in 2004, graphene has become a celebrity in the materials science and physics world due to its remarkable physical properties. One of the thinnest and strongest materials ever made on earth with incredible powers of conductivity, graphene has quickly become one of the most versatile materials discovered. Graphene-related research is currently fueling potentially revolutionary new applications in everything from faster electronics, wearable technology and smart clothing to better energy storage, sensors and medical devices. And now, mechanical engineers at the UMD may have found a way to make it even more powerful. 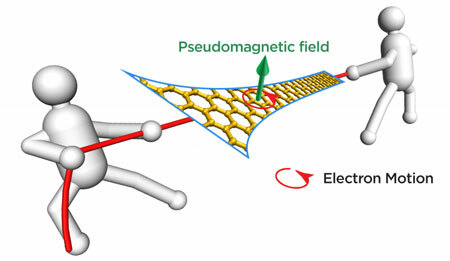 Graduate student Shuze Zhu and Associate Professor Teng Li, along with National Institute of Standards and Technology (NIST) collaborator Joseph Stroscio, have developed a theoretical model that demonstrates how to shape and stretch graphene to create a powerful, adjustable and sustainable magnetic force (Physical Review Letters, "Programmable Extreme Pseudomagnetic Fields in Graphene by a Uniaxial Stretch").